The following graph describes the distribution of different political parties versus the number of verified accounts in that party. 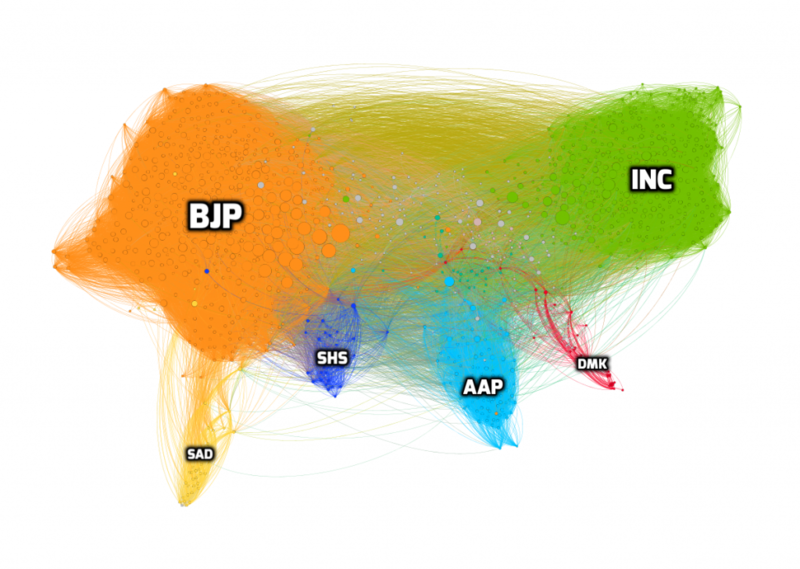 We find that ~70% of the total verified accounts are from the BJP & INC parties put together. Including AAP, this figure goes up to 78%, i.e. 78% of the total verified accounts belong to these three parties. You can access the interactive graph here. Below is the table with Party name and Number of accounts for the top 10 parties in our dataset. Next we analyse the state-wise distribution of these Verified Political handles vs Party. We can see that the maximum number of verified handles are from the state of Maharashtra, Uttar Pradesh, and NCT Delhi. These three states constitute 37% of the total verified handles. You can find the interactive graph here. 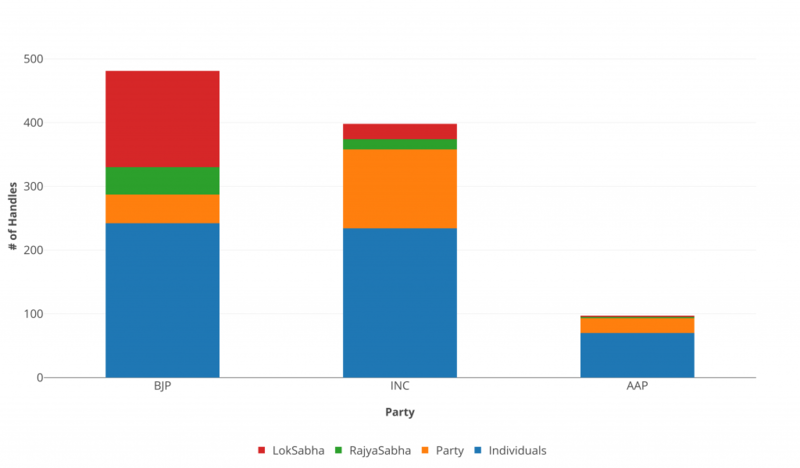 We further analysed the demographics of the 1,252 Verified Political handles by dividing these Political Handles by their Political Status (Lok Sabha, Rajya Sabha, Party, Individual). To view the analysis of these handles vs political status, please view here. 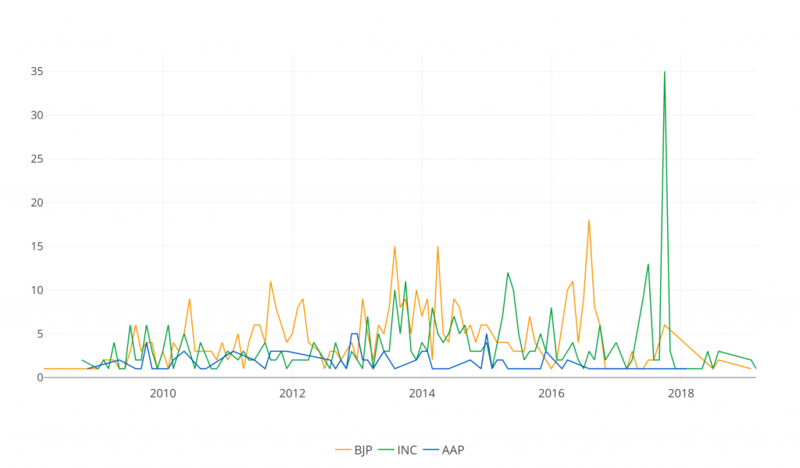 Below is the graph for BJP, INC, and AAP; we find party handles in INC to be more than in BJP. Breakdown of handles by their political status. To understand the history / timeline of the political handles, we plotted the creation time of the verified accounts vs the number of accounts created on a monthly basis. Below is the graph for the number of accounts created every month starting 2009 until now. We see a maximum of 41 handles created on the same day which are verified as of now. Creation time of the handles. Another interesting dimension to the Twittersphere is the gender distribution of the verified accounts and analysis related to it. 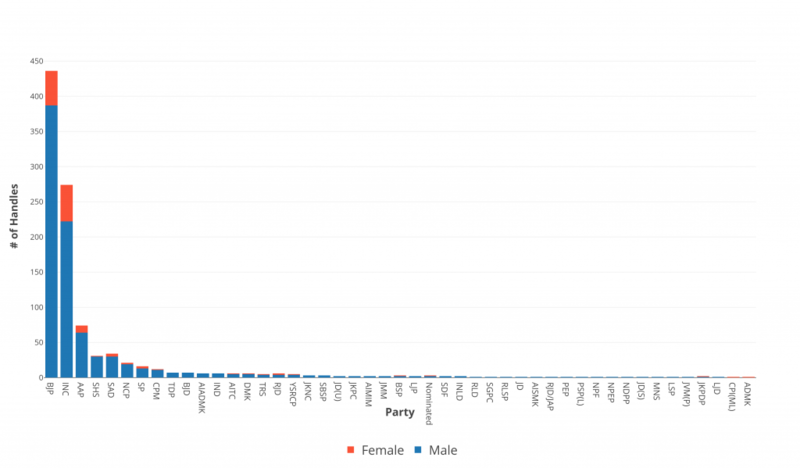 See graphs below for the gender distribution for each of the political parties. The first graph presents the absolute values of gender for each political party in decreasing order. We find 19.2% of the accounts of INC are female and 11.3% of BJP are female. The second graph presents the distribution across parties with at least one Female verified handle, in decreasing order of absolute count of Female handles. Stay tuned for more analysis on this gender distribution of the data we have. 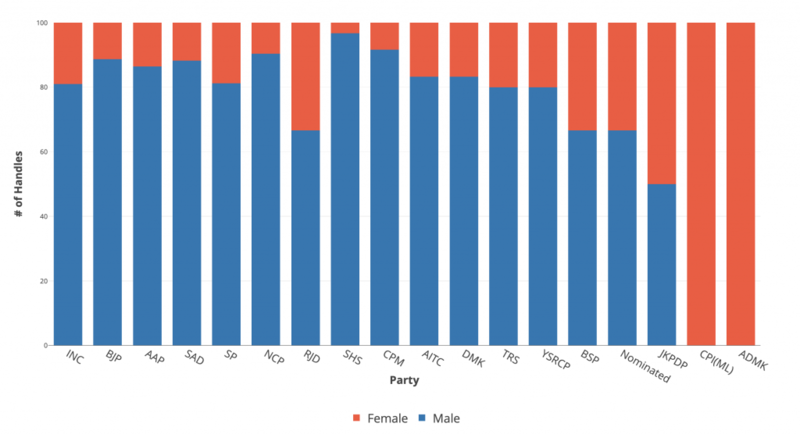 Gender distribution across parties with at least one Female verified handles. One of the most interesting analysis in the space of Web Science is analyzing the network and interactions between the nodes in the network. Below is the graph of interactions between different political handles, each color represents a political affiliation and the edge represents the following interactions. For the interactive graph of this data please visit here. Followers and Followings among all verified handles which are part of Elections. ** Given that the affiliation has been manually attributed by human annotators, in case of any corrigenda or additions of handles (that we may have missed out), please write to us at pk[at]iiitd[dot]ac[dot]in and we shall be happy to make the necessary changes in the JSON/list. *** Lok Sabha (LS) and Rajya Sabha (RS) tagged handles are handles that represent an individual elected in either of the houses of the Indian Parliament respectively. Handles tagged as Party are those which aren’t by a particular individual but represent a subsection of the Party (e.g. @IYCChhattisgarh). Individual tagged handles are those which are owned by an individual with some political affiliation. This last entity encompass Members of Legislative Assemblies, Members of Legislative Councils, Chief Ministers, Party Spokespersons at various levels, and social media cadres of various state and national parties.